LOUD! Too loud, is how I would describe Deer Tick at Lupo’s Heartbreak Hotel in Providence, RI. Granted, that could partially be the fault of being right up against the stage in front of the giant PA speakers, but that location wasn’t my choice. I blame my idiot friends, and also the Lupo’s sound dude. Don’t get me wrong. I love Deer Tick. I’ve seen them multiple times before this show and already have tickets to see them again in March at an acoustic show they are playing in Somerville (hopefully at a lower volume). And even though the volume in the room was so loud I felt physically ill, the band was great. John McCauley, with his gold tooth and Bob Dylan-on-crystalmeth voice, and guitarist Ian O’Neil shredding away were amazing per usual, and the Ryan brothers, Chris and Dennis, held down the rhythm section without a problem. My night started off by being handed a Narragansett koozie (which I’m using while writing this) by a ’Gansett Girl. After being dragged down to the very front of the stage, to the exact spot I watched Deer Tick from the first time I saw them, coincidently, McCauley started the show off by thanking Narragansett and telling everyone that the day the ’Gansett factory moved out of Rhode Island was the day his grandfather quit drinking for the rest of his life. The show started off with “Main Street” from Divine Providence and then “The Dream’s in the Ditch” from their latest record. Next was the crowd pleaser from their first album War Elephant, “Art Isn’t Real (City of Sin).” They tore through a couple of Elephant songs like “Nevada,” “Dirty Dishes” and the classic and my personal favorite, “Ashamed.” And not the “lounge version” of “Ashamed” like the last time I saw them, with just McCauley and saxophonist Rob Crowell. No, this was the bona fide “Ashamed” with McCauley using the banjo picks on his electric guitar. Mid-way through the show, McCauley’s wife Vanessa Carlton (Yes, that Vanessa Carlton who sings “A Thousand Miles”) came up and sang the duet, “In Our Time” from Deer Tick’s Negativity. After that a Springsteen cover, “Hungry Heart,” and then another old classic, “These Old Shoes.” McCauley also sat down at a keyboard and plucked out “Goodbye, Dear Friend.” It was a pretty vulnerable moment for the singer who usually finishes the 12-pack of beers he brings on stage. The song is, of course, about a friend of his who suffered an untimely death. After the obligatory band-leaves-the-stage-so-they-can-do-an-encore, Deer Tick returned with a super-long and jam-y rendition of “Mange.” For the final number, and a complete free-for-all with half-full cans of ’Gansett flying all over the room, they ripped through “Let’s All Go To The Bar” in typical sloppy Deer Tick fashion. They’re maybe not the greatest band, but Deer Tick is one of the few rock bands that live that authentic, degenerate, rock ‘n’ roll lifestyle (at least on stage). And, best of all, they’re just plain fun to see. 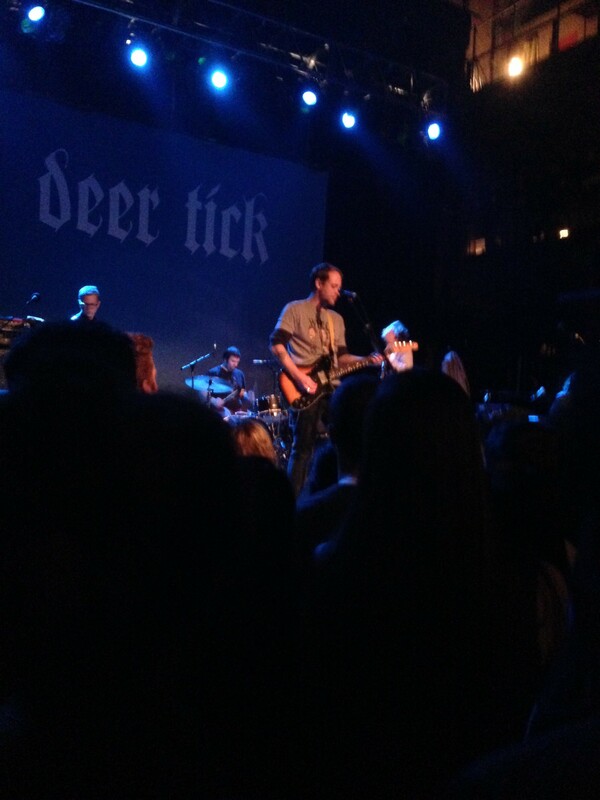 Until next time, F*CK DEER TICK!